My first ever high-end muzzloading rifle kit. 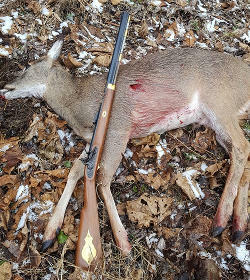 I posted this on another traditional muzzleloader forum so I apologize if you have seen it there. I just thought I would share it with you guys as well. Here is my first ever high-end rifle kit build. It is a TOTW Kit Carson Hawken kit that I bought from an individual on another site but I think he is a member on this site as well. It was a kit he ordered and decided not to build so I purchased it from him. After receiving it and looking it over I thought maybe I had jumped off the deep end. When I got into proceeding with the build there were times I was certain I had gotten in over my head, but I stuck with it. I made a few mistakes along the way but thankfully was able to correct them. I am sure I ended up spending close to $100-$150 additional having to purchase replacement parts that I either ruined or broke. My difficulty with working on a kit like this is compounded because I have a serious equilibrium problem and when it comes to tedious tasks my head begins to feel like the steel ball in a pin ball machine bouncing in all directions. I must quit for awhile until everything calms down before proceeding. Not trying to make excuses that’s just the way it is. Many years ago, like over 30, I built two TC Hawken rifle kits, one percussion and one flintlock. The first one was a very early TC kit and was more difficult than their later kits were, but they neither one came close to this kit. I also recently did one of those old simple CVA Kentucky rifle kits that was given to me by a friend. After I started this kit, I read on TOTW’s website that the half stock Hawken rifle should never be your first kit to do, but instead should be about your third kit to attempt and I don’t think they meant TC and CVA kits. Too late, I had already started and now that I have done it, I am ready to see if I can find a flintlock kit to do. Hopefully a Hawken full stock flintlock. We shall see. Re: My first ever high-end muzzloading rifle kit. Congrats! I've see a few scratch built on here and watched some of the kibler videos and ruminated with folks building "kit" guns that are all the parts, but dang sure ain't like RTA furniture from IKIA! Handicap or no, I'd say you did quite well to put it all together.looks lovely! Looks like you did a splendid job! Nicely done. Looks mighty fine to me! I wish I had the skills to do a job like that. Nice job.… Not to be picky, but what is the white crescent under the snail ?? Huntschool, it is one of my mistakes. I cut the slot in the lock plate for the snail too deep and there was a gap. I did not like the gap and did not want to purchase a new lock. I decided to make a crescent moon from brass sheet stock and fit it around the snail leaving no gap and then I sliver soldered it to the lock plate. It does not interfere with the hammer in any way. I realize it isn't original and one day may decide to purchase either another lock or if possible just the lock plate and redo it. It doesn't affect the rifles shooting accuracy in any way and in a way adds a personal touch. I will see about taking a close up photo so it can be viewed closer. Another mistake was when I installed the Trigger guard to the trigger group. After drilling and tapping the hole in the trigger group for the stud on the trigger guard to screw into, I began to insert the stud into the hole and screw it onto the trigger group. With each turn of the trigger guard I would have to pry it up on the trigger guard in order for it to clear the trigger group. It began to bind up so I thought I needed to unscrew it and chase the threads of the screw stud on the trigger guard. I tried to unscrew it but it snapped into so I had to purchase a new trigger guard. I should have chased the threads on the original trigger guard to begin with and I would not have had the problem. To be honest I saw it was threaded and didn't think I needed to chase the threads, but being cast it needed chasing. I also sheared one of the barrel staples I installed when driving the wedge pin in because I just thought it was tight for the first time being driven in. I should have been more careful and looked closer to insure they were clear of the slots in the stock. I looked and thought they were clear but should have used a flashlight so I could have seen into the slot better. I had to remove the remainder of the staple from the barrel, fabricate a staple, and reattach it, which I was able to do. In fact I think my staple is as good or better than the one that came with the rifle. It looks great, I figured the stock would have great character when finished up. Nice work!! IMO the "crecent moon" is cool, unique to you and yer build. nuff said! Thank you gentlemen for being kind to a first timer's attempt at a major kit build. For me it was a challenge, sometime a little frustrating, but I learned quite a bit and enjoyed the experience. I want to do a flintlock but think I will try a GPR first before tackling a more expensive kit. VinceM, Thanks. After it arrived and I looked it over I really questioned if I had done the right thing, but I wanted to do it really bad. I wanted the stock to come out a bit darker and thinned the stain hoping it would penetrate deeper. I probably should have read up on what other people used as a stain. I was going to inlet the patch box and purchased one. I decided not to at this time but may at a later date when I get more confident in my inletting skills. Don't fear "making a mistake" !! I recently had a (very) short email conversation with a TOTW rep. It all boiled down to this: "are you competent and able to do this project..." and "do you have a drill press?" At that moment I chose to back off from the conversation. Its NOT rocket science...but you need to pay attention to what matters! YOU can build a fine rifle that will last you for decades...Just gotta follow directions and BPrint data. Again....Not difficult!! However...y'all don't need to be intimidated! Although building a rifle isn't "rocket science" it is imperative that you take your time! So, don't be in a hurry!